An intermittent pilot system uses an electronically controlled high-voltage electric spark to ignite a pilot light and subsequently the main burners when the thermostat calls for heat. A hot surface ignition system uses an electronically controlled resistance heating element, not unlike a light bulb filament, to ignite the gas burner. 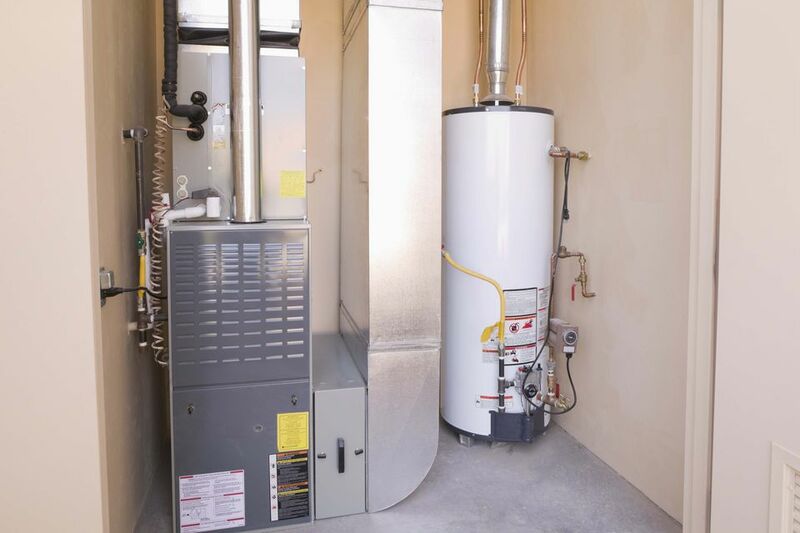 Understanding some of the basic components of a modern furnace will help you identify the type of furnace you have and narrow down the list of potential problems. Most furnaces with electronic ignition are either conventional induced draft furnaces or high-efficiency condensing furnaces. Induced draft furnaces use a small fan to draw the combustion gasses from the combustion chamber and out of the house through the flue (chimney). This system is more reliable and safer than old conventional furnaces, which relied on a natural draft coming in from an opening at the front of the furnace. Induced draft furnaces use either an intermittent pilot (IP) or hot surface ignition (HSI) instead of a standing pilot light. The combination of electronic ignition, electronic controls, and artificially created draft improves the efficiency of induced draft furnaces over older conventional models. Condensing furnaces use two heat exchangers, where conventional furnaces use only one. After the gas is burned to heat the primary heat exchanger, the secondary heat exchanger draws heat out of the hot exhaust gasses, cooling them to the point that the water vapor in the exhaust condenses into water. The resulting flue gases are so cool they can be vented outside via a plastic (PVC) pipe, while the condensed water is run to a floor drain. Condensing furnaces use hot surface ignition (HSI). The furnace gas valve for this type of furnace is identifiable with its solenoid designations: MV, PV, and PV/MV — where MV = main valve, PV = pilot valve, and PV/MV = common. The hot surface ignitor (HSI) is the most commonly used electronic ignition system. It works like a light bulb filament, heating up when electricity is passed through it. Most are made from silicon nitride or silicon carbide. The igniter is located in the flow of gas entering the burners. When the thermostat calls for heat, 24 volts are sent to the electronic ignition control module, which energizes the furnace blower and other systems and sends 120 volts to the HSI. The HSI heats up to around 1,800°F to 2,500°F and glows red-hot. Then the gas valve opens, and the burner gas is ignited by the HSI. Once a proper flame is sensed by the flame sensor, the HSI turns off and stays off until the next heating cycle. In some furnaces, the HSI also serves as a flame sensor (called local sensing) instead of having a separate sensing rod in the burner flame (remote sensing). Under normal conditions, an HSI should last for three to five years, and they eventually crack and need to be replaced. This can happen sooner if the oils from your skin get on the element through improper handling. That means: Don't touch the element with your bare hands! HSIs usually cost between $25 and $50, and it's a good idea to keep a spare on hand, in case one goes out at night or on the weekend when you can't easily get a new part. Most modern furnaces with electronic ignition systems have an integrated circuit board that controls many sophisticated processes. The boards can perform self-diagnostics and provide failure codes, similar to the diagnostic computer in your car. If a failure occurs, LED lights on the control board light up in a blinking pattern to indicate a specific failure code. The codes are listed in a chart in the owner's manual and usually on a door or access panel on the furnace. Control boards are usually located inside the blower compartment of the furnace. If the board has blinking lights, refer to the chart to decipher the code and help identify the problem area with the furnace.